People have been interested in the color of the yolk of a hen’s egg in the distribution process as an element that determines the commercial values of the egg. Therefore, the color of a yolk has been divided into 15 stages to distinguish the color density and provided a yardstick. 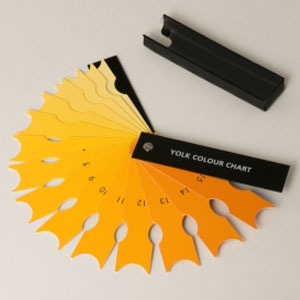 Te Roche Color fan has been widely used in the world in the past. However, Roche Ltd. in Switzerland, which produced the fan, stopped production ten years ago after making the year 1993 version. To avoid confusion of the color standard that has been used so far, we have sufficiently examined the sample colors, starting production of Yolk Color Chart (2004).